Scientists have suspected the existence of potentially artificial structures on Mars for decades. The hugely successful Viking missions of the '70s and '80s produced images containing numerous unusual objects in an area called Cydonia, objects such as the famous "Face on Mars" and the "D&M Pyramid" . Then the incredibly successful Mars Global Surveyor (MGS) began returning hundreds of high resolution images of Mars. 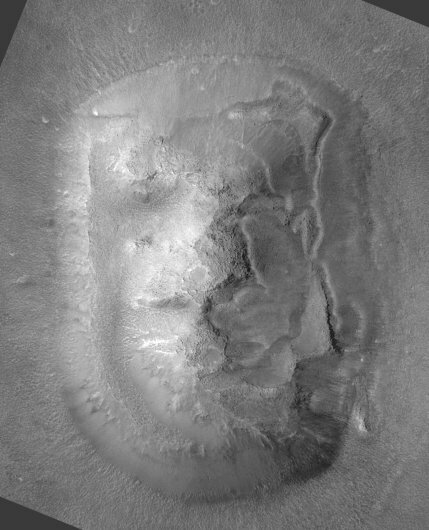 Along with more images of Cydonia, MGS yielded new unusual objects in other areas of Mars. This site is dedicated primarily to a particular class of these objects, what appears to be large-scaled artistic renderings on the surface analogous to the terrestrial Blythe Intalios or Nazca Lines. Predicted Out-Of-Frame Puma Features Verified in THEMIS Images! JP Levasseur is responsible for the content of this site. Viking and MGS images courtesy NASA/JPL/MSSS.